First appearance "Will the Real Elvis Please Shut Up!" 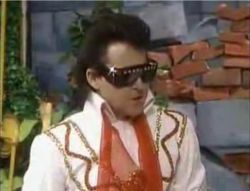 Elvis Presley is a famous, deceased singer who is also a character from The Super Mario Bros. Super Show!. In The Super Mario Bros. Super Show! live-action segment "Will the Real Elvis Please Shut Up! ", Mario and Luigi are in the midst of preparing for an Elvis Presley impersonator contest, when the real Elvis Presley, whom Mario and Luigi had thought to be dead, enters their apartment. After introducing himself to Mario and Luigi and also calling Mario's costume of him somewhat bad, Elvis decides to aid Mario and Luigi in being more like him. At first, Elvis tries to teach Luigi how to do his signature "lip twitch" using a diagram; unfortunately, even after Luigi watches Elvis perform an example of the lip twitch, he fails to perform the lip twitch. After Luigi's disastrous attempts to perform the lip twitch, Elvis, after drawing another diagram, tries to teach Mario his dance moves. At first, Mario dances quite well, but he soon begins to dance haphazardly, knocking things down and singing some of Elvis' songs somewhat horribly. Eventually, after Mario and Luigi fail horribly at imitating him, Elvis, after hearing Mario and Luigi say that if they did enter an Elvis Presley impersonation contest, it would break their mother's heart, decides to try something. Calling Mario and Luigi up onto a higher floor of Mario Brothers Plumbing, Elvis instructs them to sing together, which Mario and Luigi do extremely well. After doing their performance, Mario and Luigi turn to thank Elvis for helping them, only to notice that he is gone without a trace. After noticing Elvis is gone, Mario and Luigi suddenly hear a loud voice proclaim, "Ladies and gentlemen, Elvis has left the basement!" Throughout the segment, several references to Elvis Presley being dead are made by Mario and Luigi. Additionally, Elvis simply disappears at the end of the episode; all of these factors seem to imply that Elvis was, in actuality, a ghost. However, his disappearance at the end of the episode (and the subsequent phrase "ladies and gentlemen, Elvis has left the basement!") also references the fact that after a concert, Elvis fans remained in hopes of an encore, and staff at the locales in which the concert was held said that Elvis had left, hoping that this dispersed the crowd. In a later, animated episode of The Super Mario Bros. Super Show! entitled "Elvin Lives," a character obviously based on Elvis Presley, named Elvin Parsley, appears. Rhinestone Goombas appear to be based off of Elvis. This page was last edited on May 30, 2018, at 12:35.